Make classic Manhattan cocktails and coffee-infused drinks, and set up a festive bubbly bar to make your New Year's Eve memorable. Entertaining and lifestyle expert Maureen Petrosky is stopping by to give us great tips and recipes to help ring in the New Year. 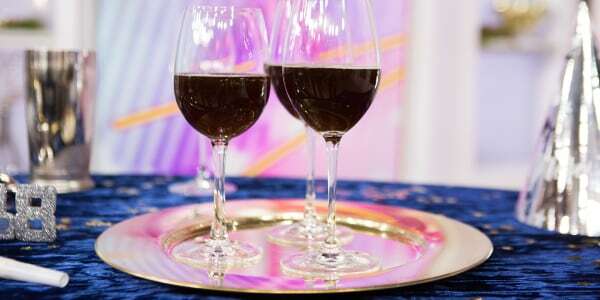 She shows how to host a fabulous New Year's Eve cocktail party, make a classic Manhattan and mix up a spiked coffee drink to help your guests stay awake until midnight. Set up a festive bar cart or bar area and decorate with balloons (stick with silver and gold and maybe a pop of hot pink). Balloons are easy and inexpensive and can be found at most grocery stores' floral departments or any party supply store. Put out a Champagne bucket with ice and a great bottle of sparkling wine, along with trays of flutes or coupes. Choose a few simple spirits to combine with the sparkling wine for easy two-ingredient bubbly cocktails. First, add one ounce of any of these spirits to a glass: Amaro Nonino, Aperol, crème de cassis, St. Germain elderflower liqueur, limoncello or Chambord. Top the glass off with chilled sparkling wine for a fun and festive sparkling cocktail. Put out small bowls of pomegranate seeds, frozen cranberries, rosemary sprigs, rock candy stirrers, citrus slices and/or hibiscus flowers on the bar cart or bar area. Encourage guests to add flair to their flutes. It is estimated over a million people watch the ball drop in New York City's Times Square on New Year's Eve. 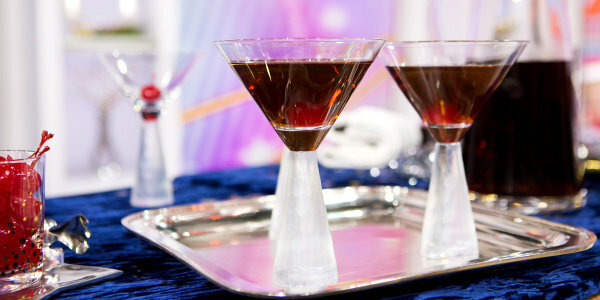 This classic Manhattan cocktail is a great toast to the Big Apple when you can't be there yourself. You can make a big batch and place it in the refrigerator ahead of time so you don't have to make cocktails throughout the night. A great Manhattan cocktail needs just 3 things: to be thoroughly chilled, well balanced and enjoyed amongst friends. Amp things up before midnight. Serve up these coffee-infused sippers to help guests stay up late enough to count down to the New Year. This is my take on the espresso martini. Grappa sometimes gets a bad rap for being harsh tasting, but it can be amazing if it comes from a high-end source. Moscato Grappa is a great place to start, especially in this caffeinated cocktail.